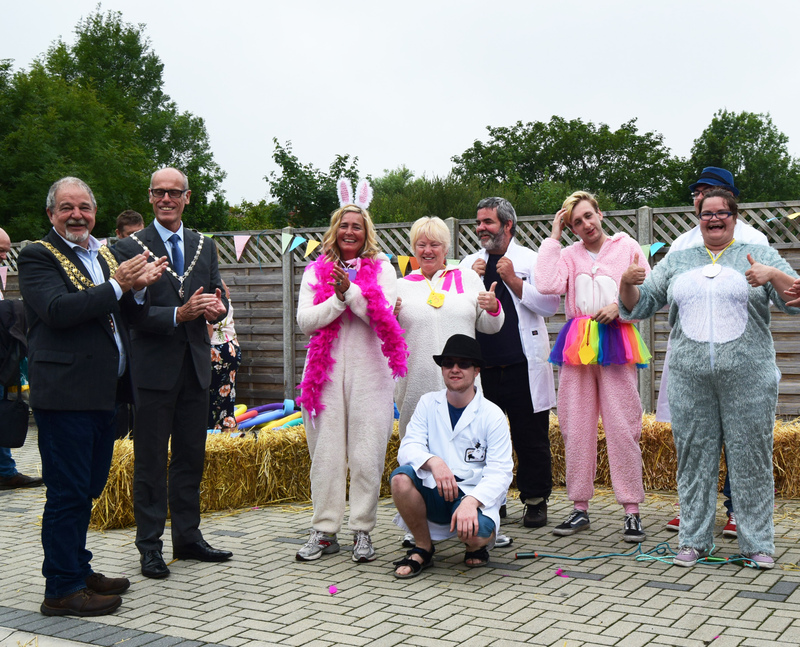 Chief Executive, Julie Layton and Chair Melba Wilson joined staff, customers, friends & family, local commissioners and the Mayor and Deputy Mayor at the first anniversary party at Albi Court earlier in August. Although there was some `mizzle' in the morning, when the festivities began the weather cooperated and everyone had a splendid time. A highlight of the day was the `Albi Court does the Royal Cornwall Show'. Staff dressed up as animals and were led around the ring by their `trainer's (customers in white coats and trilby hats). After running around an obstacle course which included; pony jumps, skipping, juggling and running, the Mayor decided that Jess `the elephant' was the winner. Jane the `Rabbit' would have come first but was penalised for a bit of pushing at the start. Luscious cakes, raffles and Cornish cream teas (jam first then cream) and a nerf gun shooting range were all on offer as well as home made sausages on the outdoor grill. Support worker Michelle brought in her sausage maker from home and staff and customers had great fun making them the day before.